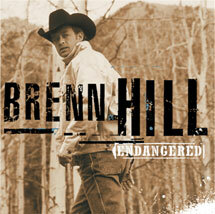 ENDANGERED, Brenn’s fifth album, features deep insight into the heart and soul of life in the west as he boldly takes on delicate issues like conservation, romance, and the indomitable western spirit. Crisp cinematic imagery is abundant throughout each of the fourteen cuts. Produced and arranged by Veteran Record Producer and songwriter Eddie Schwartz, Endangered will take you on a journey through the west of yesterday and today and offer new perspective and insight into the cowboy of the 21st Century.